Read or download the report. As South Sudan’s January 23 cessation of hostilities agreement falters, and a second round of peace talks is stalled in Addis Ababa, a new Enough Project field dispatch reflects on the causes and impacts of the conflict between the government and opposition forces and outlines core issues to be discussed in the ongoing negotiations. “Peace Must Come Soon,” written by Enough Project Co-Founder John Prendergast, advocates for a broader, more inclusive peace process that addresses governance, accountability and reconciliation, security sector reform, and regional interests. 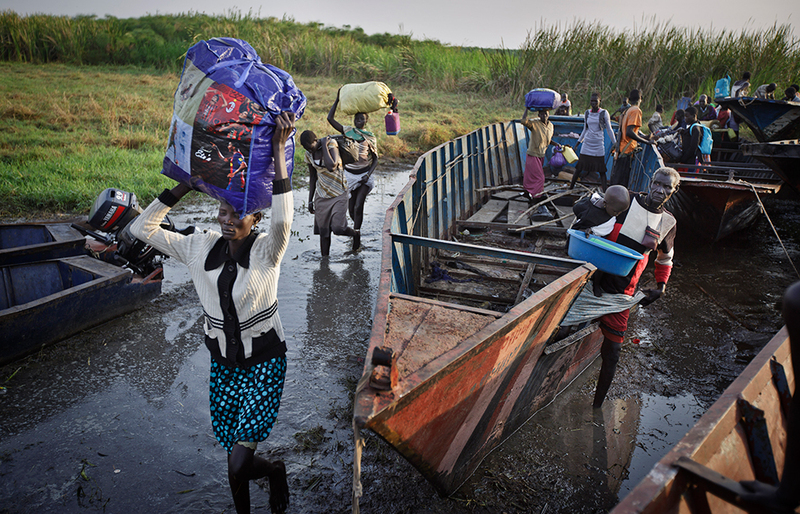 Since December, fighting has displaced approximately 716,100 people within South Sudan and sent another 156,800 refugees into neighboring states. Both sides have violated the cessation of hostilities agreement, and the Satellite Sentinel Project has documented heavy recent destruction in Malakal and Leer. In addition, opposition leader Riek Machar continues to mobilize recruits in northern Jonglei, and the government has initiated a recruitment drive throughout South Sudan. Both sides have been accused of heavily recruiting child soldiers into their ranks. In Bor, a pastor told Prendergast, “Peace must come soon. If not, the divisions will become devastating to all of us.” The current conflict in South Sudan developed from political disputes in the highest levels of the government, however, politicians have mobilized ethnic divisions in order to generate recruitment and maintain the violence. As a result, the South Sudanese people have suffered ethnically targeted killings, including against Nuer in Juba and Dinka in Bor. Prendergast witnessed the disturbing aftermath of such attacks in Bor with streets lined with body bags, mass graves, and signs of widespread looting. Ethnically driven violence has deepened sensitive ethnic schisms from previous conflicts and spurred revenge attacks. A military victory for either side is unlikely; the South Sudanese people need a true cessation of hostilities that is respected by both sides and a peace process based upon inclusion, transparency, and accountability. The current negotiations should allow the South Sudanese detainees to become a third element at the negotiation table, along with civil society groups and other political parties. With all groups participating, these and future talks must address a range of issues including a comprehensive national dialogue about governance issues, security sector reform to create a cohesive military with central control, and a strong demobilization, disarmament, and reintegration program with alternative livelihoods and educational opportunities. Talks should also address accountability questions and the possibility of a mixed chamber or hybrid court with international support to bring justice for crimes committed since December. National reconciliation plans that build upon early church-led efforts to heal the social fabric of South Sudan should be reconsidered. Taking steps toward these goals could end the suffering of the South Sudanese people and put the world’s youngest nation back on a path towards a democratic and unified state.